Celebrating 28 years of Gallatin River Adventures! Half Day Rafting Trips on the Gallatin River in Big Sky Montana. 3 hours round trip, depart hourly between 9am and 4 pm daily. This trip’s so popular because the thrills never seem to end! Under the fantastic rock walls of the Gallatin Canyon, you’ll plunge through famous rapids like Screaming Left, around House Rock, and down the Mad Mile. Rafters of all experience levels can’t get enough of this incredible ride. Class II-III Not as rough, but wet! A perennial favorite, this is a super fun cruise through towering rock formations and some of the Gallatin’s most popular rapids. This is typically the best choice for families with young children from May to July 1st. A few good soakings and the occasional wildlife sighting make this a great adventure. Availability in August is water level dependent. During high water this trip is a wet ride with big class III rapids, minimum age varies based on river conditions. Class II - III, 3 hours. Our most gentle trip but one of our favorites! Our grand scenic tour glides you through the shadows of Lone Mountain and meanders through the upper canyon and meadows of the Gallatin River. We may even come upon deer, elk, moose, or bear. A great trip for anyone who desires a mellow cruise through stunning scenery. Includes lunch, more whitewater and the best rafting value! Whether you just can't get enough of the guide's humor or you're just hoping for the best day on the river, the Full Day Rafting Trip is your adventure. Nothing beats pushing off into the river on a clear sunny morning in anticipation of the days fun to be had. The morning starts out relatively calm. Enjoy the sounds of nature and maybe an occasional wildlife sighting. We try to stay dry and comfortable for a bit but that comes to an end as we navigate some of the morning's rapids like Portal Creek and Sheepeater. save with our adventure packages! You'll never forget this day! Our most popular package and the region's best value for rafting and zipline adventure. Join us for an awesome half day of whitewater rafting… then visit Montana’s largest and newest Zipline Adventure Park! These activities can be split into separate days as well. Located in West Yellowstone, the Zipline Park is within walking distance of most hotels and only 3 blocks from the West entrance of Yellowstone. The Zipline Adventure Park features over a 1000' of ziplining thrills on 4 different, family oriented ziplines. 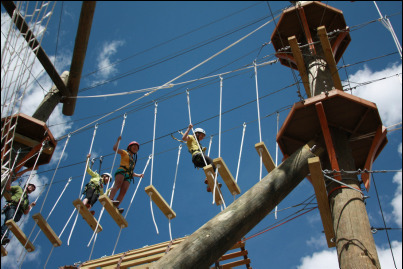 Even more exciting is the giant ropes course, featuring 49 challenge elements including spiderwebs, rope bridges, log bridges and much more. From 14' to 50’ off the ground, it offers an experience that will both thrill and challenge adventurers of all ages and levels. $88 12 and Under (6-12*). Available Everyday, can be done in 2 days as well. Begin your day with any of our half day rafting adventures. After rafting you will have time to change, check out the cool slideshow of your trip and enjoy lunch at our facilities. Next you will drive (or walk!) the 1/4 of a mile to the stables for a 2 hour horseback ride. 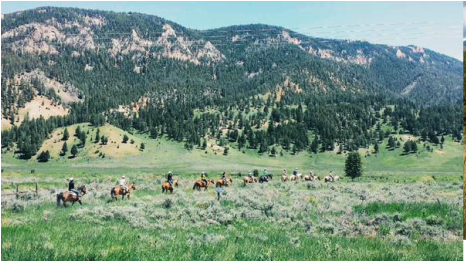 This horseback ride will take us through the meadows of the Porcupine Game Range in Big Sky, Montana. The ride features panoramic vistas of surrounding mountains and great views of the Gallatin River. Bring your camera! Minimum age of 6, no exceptions!